This Kastar spindle thread restorer die set will repair or renew damaged threads on stub axles/spindles on most vehicles. Packaged in plastic blow molded case for protection and easy use. For quick, on-the-job repairs of damaged threads on bolts and studs. Kastar spindle thread restorer die set can chase out damaged threads and remove nicks and burrs without undercutting good threads. Kastar Rethreading dies are highly tempered for strength and durability, and are 6-pt. shaped for use with socket or wrench. Kastar spindle thread restorer die set dies are color-coded for quick visual identification. Use with standard wrench and light oil. Never use Kastar Thread Restorers to cut new threads or to renew hardened threads. 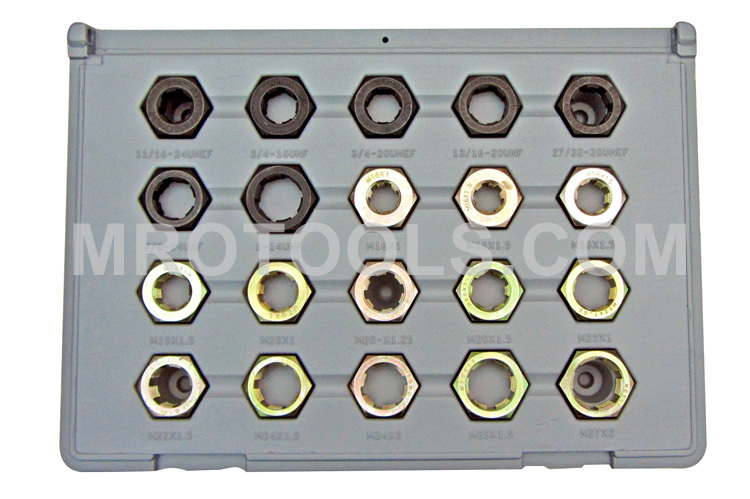 The 2599 Kastar Spindle Thread Restorer Die 20 Piece Set is one of thousands of quality tooling products available from MRO Tools. 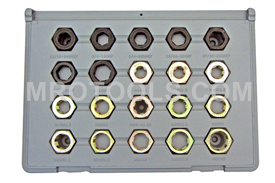 Please browse Kastar Thread Restorers for tools similar to the 2599 Kastar Spindle Thread Restorer Die 20 Piece Set. 2599 Kastar Spindle Thread Restorer Die 20 Piece Set description summary: Kastar Spindle Thread Restorer Die 20-piece Set. Sizes: 11/16''-24, 3/4''-16, 3/4''-20, 13/16''-20, 27/32''-20, 7/8''-14, 1''-14, M16-1.00, M 16-1.50, M18-1.50, M19- 1.50, M20-1.00, M20-1.25, M20-1.50, M22-1.00 Quantity discounts may be available for the 2599 Kastar Spindle Thread Restorer Die 20 Piece Set. Please contact MRO Tools for details.